The M113 Armored Personnel Carrier is in service with more than thirty armies throughout the world including the United States Army. More than 50,000 units have been produced covering 150 variants and versions during the last 20 years. Following the Korean War, demand for aluminum had reached an all-time low and producers endeavored to find new outlets for this material. At the same time the US Army had decided that there was a vital need for the bulk of military equipment to be air-transportable. As a direct result of these two complementary requirements and the fact that the T113 was marginally lighter than the T117, the decision was made for the new APC to be built of aluminum. The difference in weight was only one factor in the ultimate choice of vehicles since to obtain an equal degree of protection, aluminum armor had to be three times as thick as that of steel. However, rigidity of the aluminum hull was far greater which enabled a number of reinforcing structures to be elimated, allowing more useable interior space. Despite the high cost of this metal, the M113 became the first aluminum armored fighting vehicle to be produced in series. Unfortunately, as the welded armored plating used on the M113 has a maximum thickness of 35mm, it can only serve as protection against shell splinters and small calibre projectiles. When the T117 concept was abandoned, design work continued on the T113 resulting in the T113E1 which went into series production in 1960. the first deliveries were made by FMC the following year, less than four years after the placing of the initial US Army order. Development work continued and in 1962 a further prototype, the T113E2, formed the basis of a diesel-powered vehicle which came off the production line in 1964 under the designation M113A1. 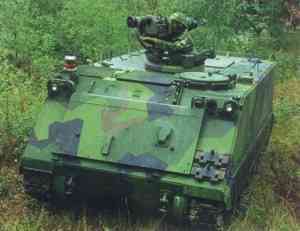 The basic M113 is powered by a 209 hp Chrysler 75M petrol engine. From 1964 onwards, the M113 was superseded by the new M113A1, fitted with a General Motors 215 hp diesel motor giving improved performance. All the transmission components on the M113A1 are arranged within the engine compartment located at the front right-hand side of the vehicle. The power unit, with water and forced draft cooling, comprises the motor, torque converter, differential, cardan joints and gearbox. The three-speed gearbox and two-stage converter provide six forward and one reverse gears. A carbon foam extinguisher mounted in the engine compartment provides protection against overheating or fire. Two generator-charged 12 V batteries connected in series and located in the rear right side of the vehicle provide electrical power. The fuel tank is installed on the rear left-hand side. rapidly leave the vehicle using the hydraulically operated ramp located at the rear of the vehicle. An emergency exit is provided in the ramp as well as several hatches in the upper part of the hull. The torsion bar suspension system of the M113 with its absence of top rollers also offers definite advantages from the weight aspect. Ten oscillating arms each linked to a separate torsion bar, in conjunction with ten pairs of large rubber-rimmed road wheels (five a side) ensure optimum road holding capability. Hydraulic shock absorbers reinforce the front and rear oscillating arms. The tracks consisting of 63 and 64 track links on the left and right hand sides respectively are driven from the engine by means of drive sprockets. The track links of simple swivel type, housed in rubber bushings, ensure maximum track elasticity. Each link is provided with a rubber pad which as well as giving improved road holding assists in reducing the overall noise level. 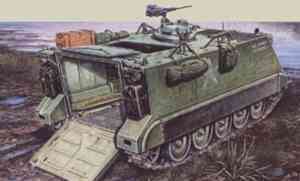 The track life on the M113 is about 4,500km but can extend to 14,000km. Track tension is regulated by mean of a hydraulic adjuster acting on the rear idler. 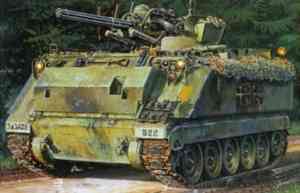 The M113's armament consists solely of a Browning M-2HB 12.7mm MG operated by the commander. His two-fold task of directing the crew while at the same time acting as gunner is aggravated by the insufficient protection afforded by the hatch which when locked in the open position only protects from the rear. A further disadvantage is that use of the externally mounted machine gun is ruled out in contaminated areas. The 12.7mm, aircooled MG can be rotated through 360° with the possibility of ground operation when mounted on a portable tripod housed in the upper part of the vehicle. Ammunition in portable boxes is stowed behind the infantrymen's seats. An outstanding feature of the M113 is its ability to be operated in water without prior preparation, a characteristic of very few MICVs or APCs at the present juncture. The M113 hull construction is completely watertight. All critical points such as hatches, doors and ramp are fitted with rubber seals. The front of the vehicle is fitted with a hinged breakwater plate which maintains correct balance of the vehicle when it tends to move into a nose-down position. 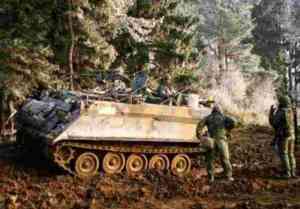 The M113 tracks are provided with rubber blades which ensure propulsion when amphibious operation becomes necessary. Two electric pumps having a combined capacity of 166 1 /min keep the interior of the vehicle free from any water which may be shipped by the M113. Supplementary braking is available for controlling the tracks and to ensure improved mobility in such environment. Since 1960, the M113 has been mass produced by the FMC Corporation of San Jose, California, temporarily at Charleston, West Virginia and under licence by SpA OTO Melara of La Spezia in Italy. Apart from those in service with the US Army, the M113 has been adopted by nearly forty countries. These impressive export figures result from three decisive factors; basic design offering full scope for specialized tasks, rapid deliveries, and low cost. In the face of escalating military budgets and the need for economic purchasing policies, an overall production run now topping the 50,000 mark has enabled the M113 to remain probably the best value-for-money vehicle available to military procurement agencies. Besides being the most widely used Armoured Fighting Vehicle in the Western World, the M113 has considerably influenced the development of Armoured Personnel Carriers including the British FV 432, the Swedish Pbv 302 and the Japanese SU 60. 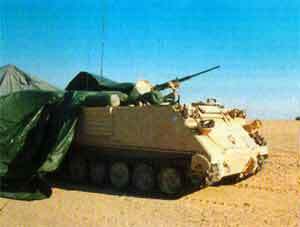 Despite considerable success, the basic M113 design has not always proved adequate. The designers were obliged to meet the US Army requirements for infantrymen to be transported to the operational area where, after dismounting from the APC, troops would complete their tactical mission on foot. This battle-taxi concept meant that the M113 design did not take into account the vital need for troops inside to be able to observe the military scenario in the combat zone. The result has been that infantryment have experienced difficulty in forming a rapid appreciation of the situation on leaving the vehicle, often under enemy fire. Unless troops expose themselves through the hatches they are unable to make effective use of their weapons, while defensive action is limited to manning the externally mounted machine gun with consequent risk to the commander who is obliged to expose himself to enemy fire. In any event, M113 design is such that while acting as 'machine gunner', the commander, located in his central cupola, cannot discharge his primary function as tactical leader. The mounting of the 12.7 mm MG is also called into question when this is comparatively ineffective against moderately armored targets. These weaknesses in design first became apparent in 1962 when two companies each consisting of fifteen M113s were operated in the Mekong Delta in Vietnam. Despite the rice paddies and irrigation canals, the M113s experienced little difficulty in covering soft terrain when called upon to leave the roads. In addition to transporting riflemen to operational zones they were also deployed in close co-operation with tanks. Their employment in this role, which went considerably beyond the original US Army requirements, served to demonstrate their inadequate firepower and protection. They could provide fire support with the main MG only at considerable risk to the commander, and any weapons carried by the crew could only be brought to bear by leaving the vehicle. In 1965, therefore, it was decided to convert the M113 Armoured Personnel Carrier (APC) in Vietnam into an Armored Cavalry Assault Vehicle (ACAV) by the incorporation of side-mounted machine guns and gun shields. The latter, however, could only serve as palliatives in the absence of a conventional turret. As far as the US Army was concerned, no turrets were introduced on a large scale in Vietnam although numbers of different turrets and cupolas have been offered commercially both in the United States and Europe. In fact, most armies equipped with the M113 are now considering the installation of turrets as may be seen in various photographs in this book. The embodiment of a turret to the basic design has frequently resulted in upgunning the original 12.7 mm or 7.62 mm MG to a 20, 25 or 30 mm automatic gun. Provision of this heavier weapon is in line with the requirement that APCs should be capable of engaging enemy APCs and similar vehicles as well as offering effective anti-aircraft defense capacity. The basic M113 has given rise to a large number of variants, ranging from mortar and rocket carriers, to recovery and bridgelaying vehicles, to unarmored transporters and radar vehicles. Very few of these variants have actually been standardized, but as long as the M113 remains the most reliable and inexpensive tracked vehicle around, more are sure to appear for many years to come. Of the estimated total of 150 variants, only the most important and the more recent are covered here. 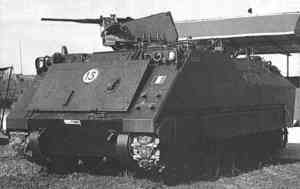 It is perhaps of interest to note that the M548 Transporter and M113 C + R, both variants of the basic M113, have themselves originated a series of variants. While only purely military applications have been examined in this book, there is also a very wide range of civil applications: basic M113 used by Swiss police on international airports for anti-terrorist security patrols; modified M113 used at Cape Kennedy as emergency vehicles; modified M113 used as tractors in Southeast Asia for towing agricultural equipment. The M113 Command and Reconnaissance Vehicle [M113C + R] supplied to Netherlands Army has a three-man crew: comman­der, driver and radio op­erator who acts as obser­ver. While the chassis has been shortened and the superstructure lowered and altered, the family resem­blance can still be seen. The requirements became evident in Vietnam for an APC to operate in close cooperation with conventional tanks. This trend in armored warfare had first been recognized in the German Bundeswehr early in the 1950s mainly as a result of successful World War II experience with Panzergrenadier units when tanks and APCs frequently worked closely together. Yet German APC design enabled infantry units to fight independently of the tanks when the tactical situation made this necessary. 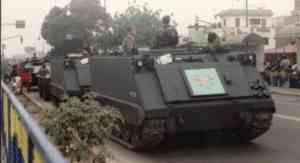 In this way was evolved the present requirement for a Mechanized Infantry Combat Vehicle, or MICV. Hand in hand with developments taking place overseas, US domestic design evolved. Based on operational experience in Vietnam, an M113 was modified at the Infantry School, Fort Benning, to carry infantrymen seated back to back, with firing ports allowing them to fire from within the vehicle. This modified M113 in turn led to the development of the XM734, more or less similar in basic concept, except for the incorporation of a centrally mounted cupola equipped with twin MGs. The MICV 65, later known as the XM701, manufactured in 1965 by the Pacific Car and Foundry Company was the first MICV to be built in the United States. Five XM701 prototypes were produced and equipped with a 20mm gun turret as well as rifle ports. Owing to excessive weight, which reached 23.7 metric tons as opposed to the 10.9 metric tons of the M113A1, development was discontinued. 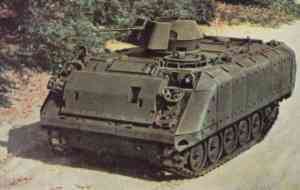 This led in 1967 to a US Army contract with FMC for the development of an MICV vehicle based on the M113 design. Two XM765 prototypes which followed incorporated the same features as the XM701 mentioned above, i.e. a 20 mm gun turret and rifle ports and vision blocks. Although these improvements met much of the criticism of the M113, they did not satisfy the exacting requirements of the US Army. In line with the FMC development programs on MICV to meet US Army requirements, developments on the basic M113 were continued both in the US and Italy. The first result was the Product Improved M113A1 which combines the hull configuration of the XM765 with the proven automotive design of the basic M113A1. FMC continued work on the XM765 concept (turret, sloped side armor, rifle ports). 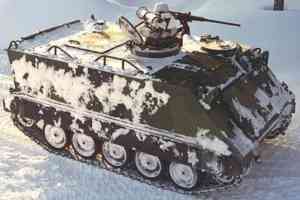 This led in 1973 to a number of prototypes known as the Armored Infantry Fighting Vehicles, or AIFV. Tests of the AIFV have been carried out by several foreign governments including Belgium, the Netherlands, and Italy, and in 1976 an order for 850 was placed by the Netherlands Government. The AIFV concept also aroused considerable interest in Italy where an Infantry Armored Fighting Vehicle (IAFV) has been developed by the Servizio Tecnico della Motorizazione of the Italian Army and is in large-scale production for the Italian forces with a view to export. Based on experience with the MBT 70 tank, a searching cost effectiveness exercise was conducted on the 1967 MICV specification which was then withdrawn and new 'austere' MICV, or MICV 70, was defined. FMC was awarded a $29.3 million contract for 17 prototypes covering a 4-year development period. The first prototype, (XM723), was completed in 1974, the configuration of which had much in common with the XM765. The production models are due to be delivered from 1978 onwards to replace the M113s still in service with the U.S. Army in Western Europe.